Even though the group isn't officially out as their 12-member ensemble until summer of this year, the amount of "STAN LOONA" tweets on Twitter alone is enough to turn people onto the group. 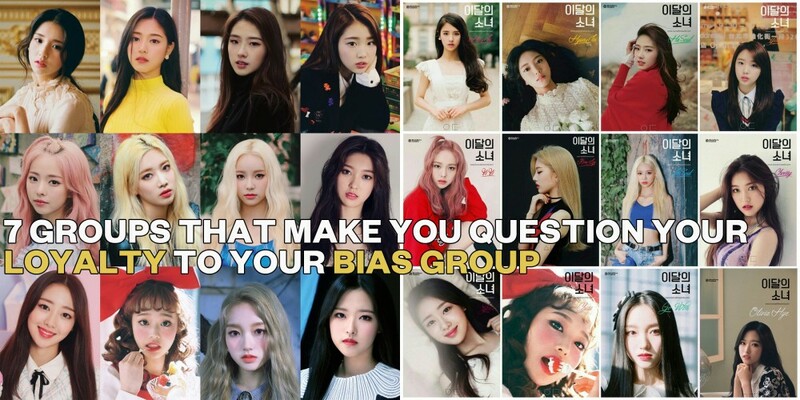 From conspiracy video theories to mysterious MV drops and member reveals, this group is absolutely intoxicating to the average K-Pop fan. It's nearly impossible not to stan LOONA and even harder to actively ignore them! Many netizens claimed that if EXID were to disband, they would stay in K-Pop just to follow LOONA. There isn't a soul on this planet who claims they enjoy K-Pop but doesn't know BTS. Since their meteoric rise in the charts, BTS has been on the tip of everyone's tongue. Given the amount of press coverage they receive worldwide, it's easy to fall into the fandom without even realizing it. With collaborations from artists around the world, stellar and intriguing MVs, and amazing fan service, this group is impossible to ignore and easy to love. Fans who aren't necessarily Red Velvet fans almost always fall into their trap at one point or another! From out-of-this-world vocals to cute charisma and personality, this group never fails to disappoint! Many fans started to bias this group when they fell in love with one member, but realized all 5 could potentially be their bias! Each member is adorable and lovable beyond belief and it's no surprise people cheat on their bias groups with RV! There's something for everyone when it comes to NCT. With multiple sub-units and styles, there is bound to be an aspect of the group that you're going to get extremely attached to. Netizens claimed that they were SHINee, BTS, GOT7 and other groups' fans before NCT released "Life" and suddenly all they could do was listen to that album! NCT has a totally intoxicating effect that draws you closer and then keeps you locked in. Numerous netizens claim that they all converted to spending their free time following TWICE. There are numerous accounts of Girls' Generation and 2ne1 fans looking for a new generation girl group to stan and TWICE happens to fit this role especially well. Many also note the similarities between TWICE now and Girls' Generation when they first hit the scene. These slight similarities are nostalgic for many and are the reason why TWICE are a bias-wrecking group. Similarly to TWICE and Girls' Generation, many fans of 2PM found themselves shifting into the GOT7 fandom. Given the big brother-little brother relationship between 2PM and GOT7, it seems natural that fans would make the switch between the two JYP groups. 2PM members have written songs for GOT7, and the transition seems intuitive. Plus, GOT7 has some of the most dynamic personalities in K-Pop within the group. Many fans who hadn't fallen deep into the trap of stanning a group experienced being a diehard K-Pop fan for the first time with SEVENTEEN. Given their whirlwind debut success, the group has converted a number of fans to their fandom to serve as full-time Carats. One netizen claims that if you don't want to stan SEVENTEEN, you must, by no circumstance, learn their names, otherwise you will become a Carat!